For several years now I have owned an R1C1 Wireless-Close-up-Speedlight-System. Here and there I have played with it. I have never taken the time to really get down and dirty. You know – Read the Manual! And put this Nikon cool system to work. This weekend was Bear Lake weekend. I think I have slept in my own bed 5 days in the last 25, maybe 30. Who’s counting? Attached to my Nikon 105 f/2.8, VR lens the R1C1 creates great opportunities for close up (macro) photography. So why not test the system even further? I invested in Kenko Extension Tubes. Yikes talk about getting close! In some respects I wish I had a 200 macro lens. The 105 with extension tube(s) puts you inches from the subject. Never tried drugging a bug before. Most insects don’t like a huge piece of glass with two or four white flashes attached. I found a couple of suiters! Did a little bribing. 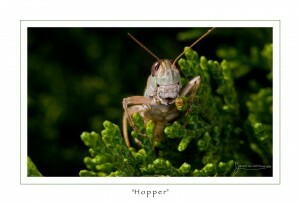 Like the grass hopper above. It’s amazing if they let you get that close how much character you get to see. He was turning his head. Moving antennas around. Those thousands of little eyes checking me out. I wonder who they see when near or far sightedness (sorry that’s the best I can spell it sounding it out) affects their vision? Bright sunlight and two flash heads. The mix was to turn down ambient light about two stops and push up the flashes by almost 1 stop. This way I got the deep shadows and greater contrast with the “hopper” to the plant. To even get any light in the background and front shadow areas I had to push the ISO to 2000. At f/29 it was getting pretty hard to fill. Overall it turned out good. aparate de sudura opinii on Brrrrrrrrrrrrrr! matelas a mousse classement on Brrrrrrrrrrrrrr! mejores sacaleches del 2017 on Brrrrrrrrrrrrrr! scie radiale classement on Brrrrrrrrrrrrrr!